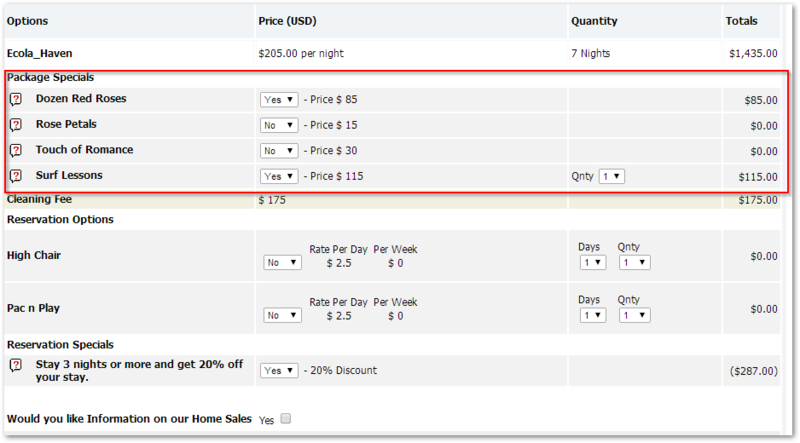 One of the many handy features of LiveRez that helps vacation rental managers increase their revenues is the checkout options feature. LiveRez allows managers to set up additional options at checkout for things like fly fishing lessons, gift baskets, lift tickets, etc. Then, when a guest gets to the checkout page they can add on these options for an additional charge (or for free if you set a charge of $0). This option allow managers to build in certain concierge style services at checkout while opening additional channels for revenue. And, the best part is they don’t have to put out any effort to “sell” these products and services; they can simply “offer” them as an option. Another cool part of this feature is the ability to set up a contact per option. Let’s say you are partnering with a local fishing guide to offer fly fishing lessons. You can set up the guide’s email address within the option, and then any time that option is purchased, the guide will get an email letting him know that someone has booked a fly fishing lesson. This helps you expedite the delivery of the services – again, helping you make more money without much extra work. To learn more about how LiveRez can help your company earn more revenue, contact us now at (800) 343-2891 or email Sales@LiveRez.com.